Samsung had launched its first M-series smart phones which marked their new beginning of the year. They are are expected to be launched on 5 February 2019 and the announcement was done on January 2019. The price of Samsung Galaxy M10 starts from Rs. 7,990 for the 2GB RAM with internal memory of 16GB and Rs. 8,990 for the 3GB RAM with internal memory of 32GB. On other hand, Samsung Galaxy M20 costs Rs. 10,990 for the 3GB RAM with internal memory of 32GB, and Rs. 12,990 for 4GB RAM with internal memory of 64GB. 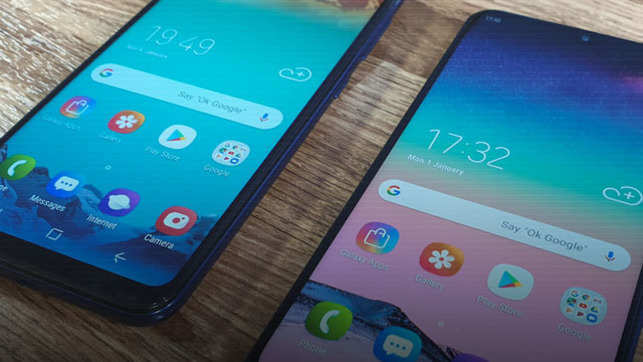 Both Samsung Galaxy M10 and M20 are same in size which is 156.4 x 74.5 x 8.8 mm in dimension and 186 g weight. Both are available in Charcoal Black and Ocean Blue colour variants. Both the screens are of PLS TFT capacitive touchscreen supporting 16M colors and runs in Android 8.1 Oreo. Samsung Galaxy M10 and M20 are powered by Exynos 7870 SoC and Exynos 7904 SoC respectively along with Octa-core CPU and GPU of Mali-G71 MP2. The memory of both the phones can be expanded via microSD up to 512 GB. The display of Galaxy M10 is of 6.2-inch HD and 720×1520 pixels with Infinity-V Display panel and aspect ratio of 19:9 whereas the display of Galaxy M20 is little larger 6.3-inch full-HD with 1080×2340 pixels and Infinity-V Display with an aspect ratio of 19.5:9. Both of them are having the rear camera of 13-megapixel primary sensor with f/1.9 aperture and another 5-megapixel secondary ultra-wide sensor with f/2.2 aperture. But the front camera of Samsung Galaxy M10 is 5-megapixel f/2.0 sensor and the Galaxy M20 is 8-megapixel front f/2.0 sensor. Samsung Galaxy M20 has fingerprint sensor at the back of the phone whereas such sensor id not mounted on Samsung Galaxy M10. The Galaxy M10 comes with a Micro-USB port and Galaxy M20 comes with USB Type-C port. Other connectivityof the phones includes Wi-Fi 802.11 b/g/n, WiFi Direct, hotspot, Bluetooth 5.0, GPS, FM radio, RDS, recording. The sensors includes accelerometer, gyro, proximity, compass in both. Galaxy M10 is powered by 3,400mAh battery and Galaxy M20 by 5,000mAh battery.